Pravda, journal (Truth). 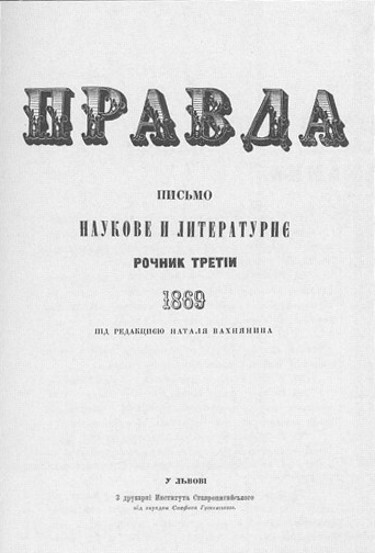 A literary, scholarly, and political journal published in Lviv three times a month in 1867, four times a month in 1868–70, semimonthly in 1872–8 (in 1878 it also issued a miscellany in 2 vols), monthly in 1879, as a miscellany in 1880 (1 vol) and 1884 (1 vol, ed Volodymyr Barvinsky and Ivan Franko), and again as a monthly in 1888–93 and a semimonthly in 1894–6. It was initiated by intellectuals in Lviv and elsewhere in Galicia, but was funded by the writers Panteleimon Kulish and Oleksander Konysky from Russian-ruled Ukraine. 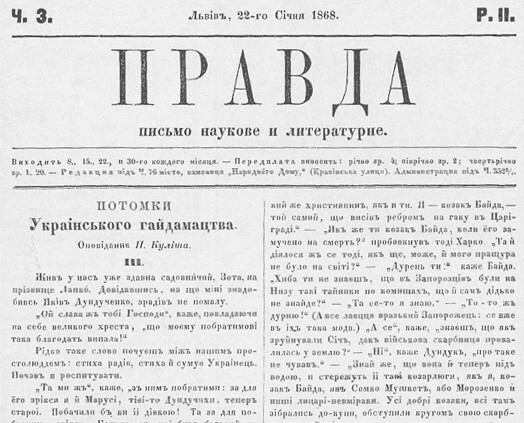 Until the establishment of the newspaper Dilo in 1880, Pravda was the main organ of the Galician populists and the most important journal of the time. Its contributors included many writers and scholars in both Austrian- and Russian-ruled Ukraine, among them Oleksander Ohonovsky, Ivan Franko, Omelian Partytsky, Ivan Verkhratsky, Oleksander Barvinsky and Volodymyr Barvinsky, Yurii Fedkovych, Sydir Vorobkevych, Volodymyr Navrotsky, Mykhailo Podolynsky, Ostap Terletsky, Oleksander Konysky, Panteleimon Kulish, Hanna Barvinok, Marko Vovchok, Panas Myrny, Mykhailo Starytsky, Ivan Karpenko-Kary, Ivan Nechui-Levytsky, Stepan Rudansky, and Oleksa Storozhenko. In this period the chief editors of the journal were I. Mykyta, Anatol Vakhnianyn (1869–70), O. Ohonovsky (1872–6), L. Lukashevych (1876), and V. Barvinsky (1876–9). Beginning in the early 1870s it was openly criticized by Mykhailo Drahomanov, a regular contributor, who in 1873 submitted an open letter on behalf of 76 noted Ukrainians in the Russian Empire complaining about the conservative orientation of the journal. An index to the first volumes appeared in the 1884 issue. After a four-year interruption Pravda resumed publication in 1888 on the initiative of Volodymyr Antonovych and Oleksander Konysky. In the 1890s it was the chief organ of the populist right and supported the politics of the New Era. The publishers were Yevhen Olesnytsky (1888), Ivan Stronsky (1889), P. Kyrchiv (1890–1), and A. Berezynsky (1891–6), but the main force behind it was Oleksander Barvinsky. Pravda strongly criticized the Russophiles and the new Ukrainian Radical party; it engaged in spirited polemics with the leaders of that party, Ivan Franko and Mykhailo Pavlyk, who until then had co-operated closely with it. Literary contributors in this period included Borys Hrinchenko, Mykhailo Kotsiubynsky, Ahatanhel Krymsky, Mykhailo Komarov, Osyp Makovei, and Yuliian Romanchuk. A referral to this page is found in 43 entries.